February is National Bird Feeding Month. The end of winter is the hardest time for birds to find food, unless of course you are a bird of prey! We love watching the many birds of prey in our area, except when they are dining on cute little song birds! 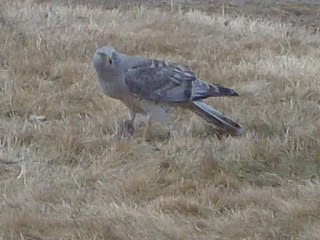 We think it is a Northern Harrier, but please feel free to let us know if you can positively ID the murderous fowl. That will help us if he makes another appearance during the Great Backyard Bird Count which is February 12 - 15. You can find out how to participate in the count here. P.S. I decided to post the PG version of the Harrier? dining on one of our backyard birds. Just because he did it outside our kitchen window at lunch, is no reason to ruin your appetite! They birds are showing up here with bottomless pits...filling the feeders about everday!